Trailhead and parking area are on Rt. 16, in Pinkhams Grant, NH, 11.8 miles north of its northern junction with Rt. 302 in Conway and 10.6 miles south of its eastern junction with Rt. 2 in Gorham. There is a very large parking area on the west side of the road at the AMC Pinkham Notch Visitor Center. Rugged Wildcat Mountain rises steeply from the east side of Pinkham Notch. The many peaks on its long ridge are identified by letters, from A Peak, the highest, at the northeast end, to E peak, the lowest, at the southwest end. Only D and A peaks qualify for the 4000-footer list, but hiking to these two requires summiting all five Wildcat peaks anyway. This makes for a very long and tiring hike, since the trail atop the ridge involves many short ascents and descents and it must be hiked both directions. In addition to this, the climb to the ridge top is extremely steep and rocky, being among the most difficult hiking trails in the White Mountains. It is not hard to understand why Wildcat is hated by many hikers. Like all such mountains, Wildcat has plenty of good features as well. The Wildcat Ridge Trail to E Peak crosses four ledges of increasing elevation with spectacular views of Pinkham Notch and Mt. Washington. The highest of these ledges commands one of the best perspectives of Mt. Washington's ravines. Atop the ridge, views are scarce, but at the summit, there is an unusual view across Carter Notch to very close-by Carter Dome. And at the beginning of the hike, you will stop at Lost Pond. The hike begins at the Pinkham Notch visitor center. Cross the road to the sign for Lost Pond Trail and follow the boardwalk across a marsh. On the other side, turn right as Square Ledge Trail continues ahead. In 0.2 miles, the trail joins the Ellis River just after its formation at the convergence of the Cutler and New Rivers. The trail follows the river for a short way, then pulls away and climbs steadily on a rocky pathway for 0.2 miles to reach the northern shore of the pond. The trail follows the shoreline past several boulder-filled viewpoints over the water. Mt. Washington rises over the trees to the right. The summit is not visible, but there is a great view into Huntington Ravine and Nelson Crag above. From there, the trail proceeds through more boulders, soon joining the outlet of the pond and descending along it 0.4 miles to the Wildcat Ridge Trail. Note: You can reach this point in just 0.1 miles by parking at the trailhead for Wildcat Ridge Trail (at the Glen Ellis Falls parking area), but you will not visit Lost Pond, and you will have to cross the Ellis River, which is very difficult at most water levels. Turn left and follow Wildcat Ridge Trail as it immediately begins climbing. After a short pitch, the trail crosses a level area, then becomes extremely steep and rocky. In 0.3 miles, the trail encounters a tall rock face and turns left, following a narrow pathway along its base. To reach the top of the cliff, you must make a difficult climb up through a cutout in the rock using small steps. From the top of the ledge is the first view over Pinkham Notch. Across the valley are Slide Peak and Boott Spur, with the Gulf of Slides seen below Boott Spur. Mt. Washington is further to the right, with its summit still hidden. Past this viewpoint, the trail continues very steeply through the forest. The next view ledge is reached after a 500-foot climb. The view is nearly the same, but there is now a better view to the south, and Mts. Adams and Madison are now visible to the right of Washington. The climb continues again past here, but the trail soon eases as it crests the ridge. After a welcome break from the relentless climbing, the trail resumes the ascent and negotiates another tough rock scramble, soon reaching the third viewpoint at 0.9 miles from Lost Pond Trail. This flat ledge provides a fine view to the south of the Moat and Sandwich Ranges, as well as a good look up the mountainside at the rugged terrain you must soon ascend. The trail descends briefly, then runs flat for a short distance before climbing again. It goes up a steep rock slab and crosses a viewless ledge, then makes another minot descent. The trail soon becomes extremely steep and rocky once again. Midway up this short climb, the trail passes a small cave on the right, then a side path to a spring on the left. In 0.2 miles from this side path, the trail climbs up very steep slabs with the aid of wooden steps. At the top of this open area are excellent views of Mt. Washington and its Tuckerman and Huntington Ravines. The trail then re-enters the forest, and the grade gradually eases. In the final 0.4 miles to the first of the Wildcat peaks, the trail makes three small but steep descents. The trail then crosses the summit of Wildcat E and descends 0.2 miles to the top of Wildcat's ski area. This point is also accessible by gondola or by walking up Wildcat's ski trails. From the top of the ski trails, there are more great views of Mts. Washington, Adams, and Madison. On the east side, there is a restricted view of Kearsarge North and other mountains around Conway. Ahead is the summit cone of Wildcat D. Cross the top of the ski area and follow the trail up a rock behind the wooden building and back into the forest. A quick climb leads to the summit of Wildcat D, one of the two Wildcat 4000-footers, and its observation tower. A gravel trail from the ski area enters on the left. From the tower, the view is similar to the ski area's but is mostly overgrown. You may glimpse the other Wildcat peaks ahead through the trees. From the tower, the trail descends gradually, passing a limited vista to the east, then drops down over steeper terrain with glimpses to the north and ahead to Wildcat C. The trail reaches Wildcat Col in 0.3 miles from the tower, and crosses a small bog on bog bridges. It then climbs over a hump and drops into another col which appears to be about the same depth. Here, the trail crosses a larger bog, then begins to climb again up a fairly steep and rocky slope. The terrain becomes rougher near the top, and after one rock scramble, there is a good view back over the trail of Mts. Washington, Jefferson, Adams, and Madison, as well as of Wildcats D and E and mountains beyond. 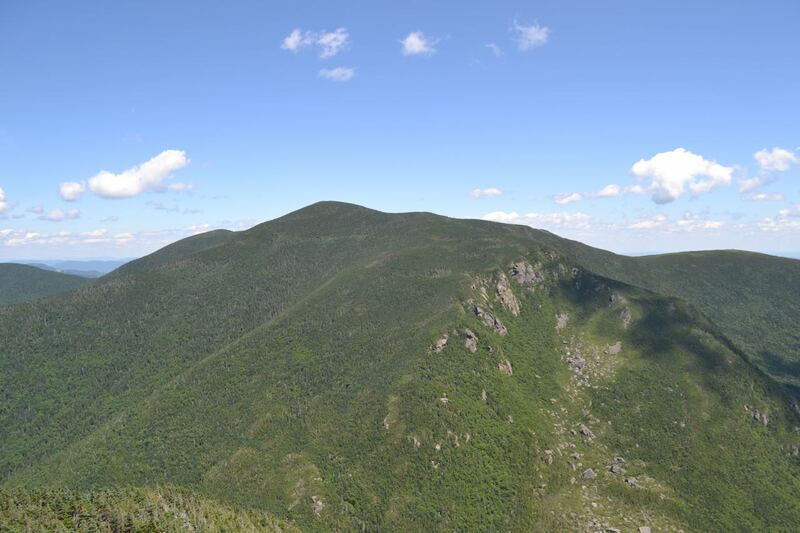 The summit of Wildcat C is reached in 0.6 miles of climbing as has a very limited view to the east of the Baldface Range, Kearsarge North area, and Conway. The trail descends easily from C Peak, passing through an open area in the forest before reaching another bog. It continues through a few boggy areas, then ascends moderately to Wildcat B, where there again are no views except ahead to Wildcat A. The trail descends for the final time 60 feet down into a blowdown patch, then continues easily up to A Peak, the summit of Wildcat Mountain, reached at 2.0 miles from Wildcat D and 5.0 total miles. A herd path on the right leads a few feet up to the true summit, while just past this, a viewpoint spur leads to Wildcat's clifftop viewpoint. This small ledge overlooks Carter Notch and provides an impressive view of the cliffs of Carter Dome across it. To the far left are a variety of distant peaks in the Great North Woods and Maine, seen over the city of Berlin. A long ridge leads up from the valley to Middle Carter Mountain. South Carter Mountain is in front. To the right, a few more mountains in Maine can be seen through Zeta Pass, as well as ledgy Shelburne Moriah Mountain. In front of you is the massive Carter Dome, with Mt. Hight just to the left. Beneath the cliffs on Carter Dome's west ridge is a long talus field called The Rampart, which leads down to the Carter Lakes and AMC's Carter Notch Hut. The Wildcat River valley leads to the east from the Carter Notch area. To the right of Carter Dome is South Baldface; next over is Sable Mountain, then Chandler Mountain. Behind Chandler is Maine's long, ridge-like Pleasant Mountain and in front is Black Mountain, also long and ridge-like. Further to the right, a ridge begins at Mt. Shaw and the Twins and leads up to conical Kearsarge North; Doublehead Mountain is in front.